View of the Great Mosque across Damascus rooftops. Moscow, December 4, Interfax – Moscow condemns Syrian extremists’ activities to incite inter-faith feuds and wants them to be stopped. “The terrorists’ aggressive criminal attacks against worship sites and religious figures must be stopped. This is also important in order to create an appropriate environment for calling an international conference on Syria in Geneva on January 22 2014,” the Russian Foreign Ministry said in a commentary, posted on its website. Reports are arriving from Syria suggesting that “the armed extremist formations have centered on the task of inciting ethnic and inter-faith conflicts,” the Russian Foreign Ministry said in an attempt to draw the attention of international and regional partners in Syrian settlement and international humanitarian organizations. It cited numerous facts of extremists’ criminal operations. 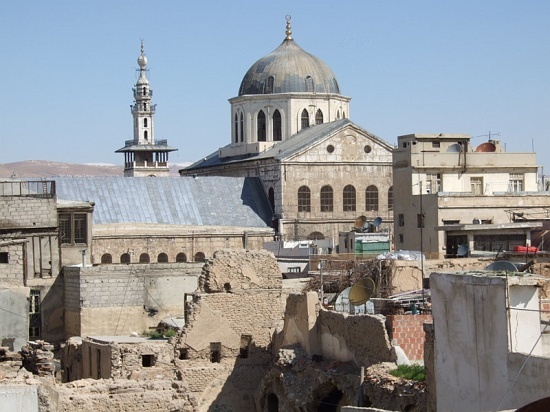 The Great Mosque of the Omeyas in the historical district of Damascus was shelled on November 26. Four people were killed and 26 injured as they were returning from the mosque. This unique cultural monument , entered on UNESCO’s cultural heritage list, has always been seen in Syria as the symbol of peaceful coexistence between the Muslim and Christians. A basilica, where relics of John the Baptist are believed to be kept, is located in the mosque as an object revered by both Christians and Muslims. Media reports said that the militants, retreating under the pressure of an offensive by the government troops near Kalamoon, again entered the central part of the Christian town of Maaloula, broke into the Christian monastery Mar Takla (St.Thakla), one of the most popular Christian centers in Syria, and abducted Mother Pelagia and 12 Syrian nuns. Extremists and bandits continue committing crimes in the provincial center of Raqqa, brazenly desecrating worship sites and attempting to destroy traces of Christian presence. The fate of the Orthodox and Syro-Jacobite metropolitans, and a Catholic priest remains unknown. The Muslim religious figures who venture to resist attacks on Christians and to defend the true humane values of Islam, are attacked, too. The head of the Jeru Da Mosque outside Damascus , Sheikh Hussein al-Qadri was attacked on December 1 and seriously wounded. Earlier, the popular preacher, Sheikh Muhammed Ramadan al Bouti, the son of Syria’s Grand Mufti Sheikh Hassoun, and other prominent Muslim figures and members of their families were killed by terrorists.